This four-part series examines the NFL’s $60 million investment in the Engineering Roadmap to develop research and technology to make football safer. Part one discusses the data behind the controversial helmet rule. Part two outlines the engineering work supporting the roadmap. Part three discusses the crowdsourcing of innovative solutions. This part looks at the future of the program and a new data collection device. The University of Virginia football team’s season-opening 42-13 victory over Richmond seemed like just an unremarkable rout of a much smaller program. Hidden from public view, however, was something quite noteworthy: at least two-dozen Virginia players were wearing a new sensor technology embedded in their mouthguards that had been developed by NFL-commissioned engineers. When the NFL allocated $60 million to its Engineering Roadmap of health and safety initiatives in 2016, the league selected the leaders of Virginia’s Center for Applied Biomechanics to head the effort. The center’s director, Jeff Crandall, and his deputy, Richard Kent, have overseen that research from their Biocore consulting lab in Charlottesville. Previous efforts to monitor head impacts focused primarily on sensors built into helmets, but tests of those systems showed that the head often moves differently than an exterior shell. Mouthguards are preferable because the upper jaw is part of the skull. The league has tested a number of commercial and research sensor-laden mouthguards, but Biocore has also developed its own version under the stewardship of senior research scientist Nate Dau. 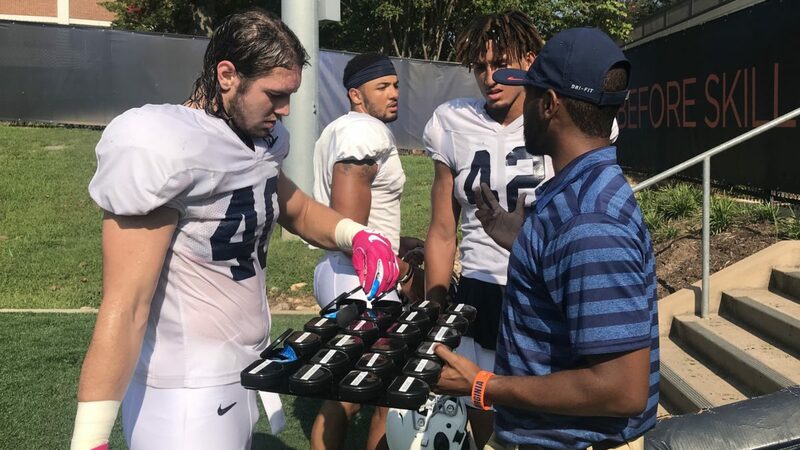 If the pilot test with Virginia goes well, the goal will be to provide the mouthguards to NFL players on a handful of teams on a limited basis in 2019. Few specifics are available about the device or the trial. Crandall said the Biocore product uses minimal power, is of minimal size, and was built in coordination with a sensor partner and a boutique electronics partner. He added that the device was custom-built to measure head kinematics during typical NFL impacts and that there has been significant feedback from the NFLPA about the size and fit. Accurate and more granular data is needed to quantify the impact forces on the field, and is critical for the NFL to improve player safety and reverse the trend of concussions—which reached a record high in 2017. Crandall has said there is a goal of introducing position-specific helmets to protect against the particular types of collisions each player typically endures. All NFL players wear Zebra athlete tracking chips in their shoulder pads, recording location and velocity, but there are no impact sensors on the field of play. The league and the NFLPA are collaborating closely on mouthguard development because it would provide the best data source yet to understand hits. In conjunction with the Engineering Roadmap’s forensic video reviews and other tests using crash-test dummies, the NFL will release that information to spur innovation. “The outcome of that is going to be a level of detail and specificity that’s going to help an entrepreneur come up with an idea that’s going to address a specific problem,” said NFL EVP of health and safety Jeff Miller. The NFL has not disclosed the results of its evaluation of the previously developed mouthguard sensors. Crandall said those products’ maturity and experience are beneficial for evaluation as his team pursues a parallel path. One of those mouthguards is produced by Prevent Biometrics. Its device will be available to thousands of high school and college football players this fall, according to chief science officer Adam Bartsch. He said Prevent continues to prove out its product as the company builds a robust system to support data collection and instant analysis. Prevent has begun syncing video footage with real-time hit data for evaluations. To further support the advancement of new ideas, the Engineering Roadmap had four finite element models of different helmet designs built. These complex digital models are a helpful tool for early-stage computer simulation testing of innovations. That in itself was a major undertaking, with each of four universities tasked with one helmet apiece. The process of shepherding an idea from initial concept through prototype, testing, and development to commercial viability can take three to six years. The NFL hopes the supply of data from all sources can expedite that process. Other avenues of head impact screenings are in development as well. In February, the FDA approved its first concussion-related blood test. Banyan Biomarkers can test for two protein biomarkers that can eliminate the need for a costly and time-consuming CT Scan. Baynan and Quanterix, both former GE Head Health Challenge grant recipients, have begun partnering on some tests, and Quanterix CEO Kevin Hrusovsky believes his company’s technology will offer enough detail to one day make a more definitive concussion test—perhaps even on a sideline. Earlier this year, Quanterix released a benchtop instrument that is more compact and portable than its signature wardrobe-sized Simoa machine. Hrusovsky said the process of taking blood and analyzing the specimen for the biomarkers that are indicative of a concussion currently takes about 10 minutes. But he sees a clear path to expediency by producing dedicated machines that hone in on particular biomarkers. “We probably can get this down to a few minutes,” he said. The ultimate goal of all of this research and data collection is protecting player health. Whether monitoring for dangerous impacts through a mouthguard sensor or screening for a possible concussion via a blood test, the aim is to find ways to decrease the risk and seriousness of head injuries. NFL commissioner Roger Goodell pledged that the league will “let science lead the way.” At some point, science will produce results. Then, the onus will be on the sport to heed them.